March picture book catch up. In pictures :) This is the main body of it. That's a whole lot of books! Titles etc: Picture a Greener future (Worcester Bosch) Bob's best (ever) friend. Simon Bartram The bad tempered lady bird. Eric Carle Love Monster. Rachel Bright Walter and the no-need-to-worry suit. Rachel Bright Charlie and … [Read more...] about March picture book catch up. 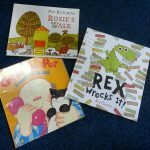 A selection of favourites – 300 picture books week 1. I'm really enjoying focussing on reading different picture books every day, although there are obviously quite a lot of rereads too, in order to hit the 300 Picture book target. I've fallen slightly behind in the daily review over at Shingle Street, sigh, but I'm keeping up with instagrams of the … [Read more...] about A selection of favourites – 300 picture books week 1. 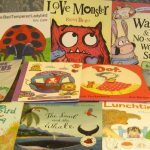 Last year I took part in Child led chaos 300 picture book challenge. I made it to 150 I think, and then lost track, heart, the plot and so on. (There were some really difficult bits towards the middle of last year.) 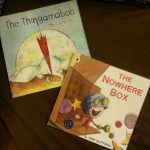 Anyway, as Anne-Marie's children are moving on to chapter books, she's decided … [Read more...] about 300 Picture books!